The department posted pictures of the apprehension to its Facebook page, saying that the animal was "carefully removed without harm from the area and relocated to a safe place." Image courtesy of Jupiter Police Department / Facebook. Officers with the Jupiter (FL) Police Department were called along with state wildlife officials to capture an alligator that had been lurking on the property of a local business owner. 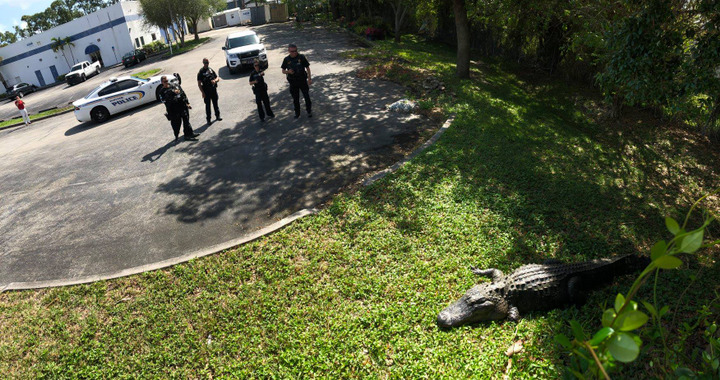 According to the Sun Sentinel, the alligator was estimated to weigh 750 pounds and may be around 100 years old.